﻿ National Blue Trail - Who am I? I think, the protagonist of this website is the National Blue Trail and not me, but I try to introduce myself in the next few rows. I was born in 1959, and I lived without hiking more than 44 years! I have been working in different power plants since 1985, they are a little bit noisy and stressful working places. But I felt, something was missing in my live... One of my colleagues called me to complete the most well known Hungarian power hike, the 100 km long Kinizsi100 in 2003. I did it within the limit time, but I realized two things during the many months long preparation. First the power hike won’t be my favourite because of the continuous rush, but I fell in love with the walking in the forest and especially with the National Blue Trail, because the two third part of the Kinizsi100 leads on the route of the Blue Trail among the hills of Gerecse County. 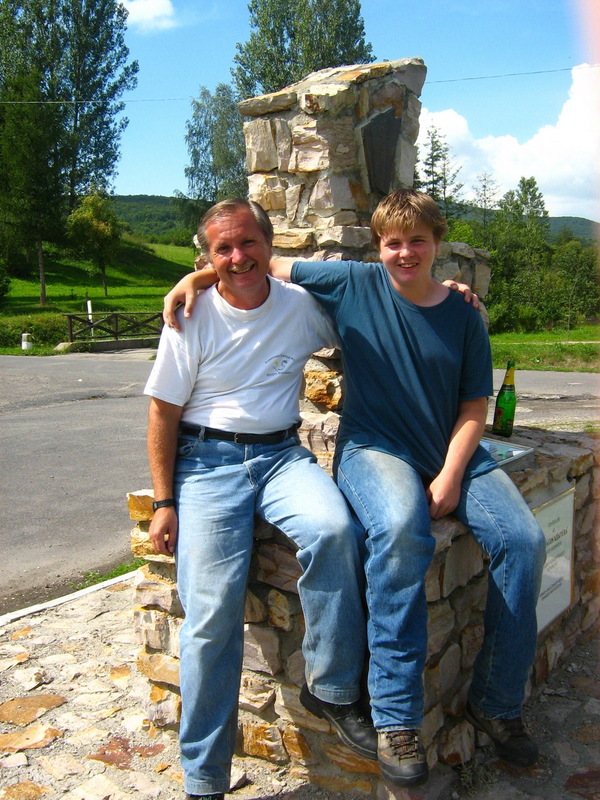 I started to complete the National Blue Trail with my son in summer 2003, and we finished it three years later. We walked together from the first steps until the last ones. It was a natural thing that I continued the walk on the route of South-Transdanubian Blue Trail, but I struck up parallel with it the National Blue Trail again. I have completed three times the National Blue Trail, twice the South-Transdanubian Blue Trail and once the Blue Trail of the Plain in the past years. Unfortunately I don’t have enough time to complete the whole route of the Blue Trails at once, I divide them onto 3-5 days long sections and I hike with tent between March and October. The wild camping is an allowed thing in Hungary! This website started in 2004, first only on Hungarian language. The English version was born a few years later and its aim is to advertise the National Blue Trail for foreign hikers. I’m a middle graduated hike leader since 2013, I organize hikes mainly for my colleagues and friends. If you would like to contact me, you can find my e-mail address here below my signature and at the bottom of every page of the website. A few words about my name: according to the Hungarian grammar I wrote first my surname and it is followed by the „first name”. I know, it is very unusual, this form of the names is used outside of Hungary only in the Far East (China, Japan, Korea, etc. ).